Enormous architectural assemblages made from fragmented reflective materials dominate the scene upon entrance (even the gallery floors are mirrored). One encounters vibrant complexities of seductive shimmer wherein dark anxieties hide. When you make your way through a labyrinth of corridors, perceptual and cognitive bearings are disrupted. As you confront your own existence in the reflection of acrylic and polycarbonate mirrors, two-way mirrors, stainless steel, and LED lighting throughout these large-scale sculptures, visions of a new modernist architectural construct take hold. It is an intense and disorienting experience. 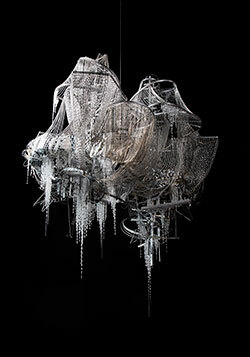 Born in 1964 under the military dictatorship of South Korea, Lee Bul studied sculpture at a university in Seoul. Mirror and crystal architectural assemblages reflect what Bul sees as the failing of utopian optimism; her provocative works delve into the ways that ideologies permeate society. This show highlights her reflections on the failed ideals of recent history and the human optimism that prevails in the face of an uncertain future. It takes up to six months to complete a sculpture. “When I’m making an exhibition”, Bul says, “ I think about how can I make a visual rhythm?” Bul also states that she doesn’t care how the viewer reacts to her work. She shocked the Korean art world by defying boundaries and tackling issues related to utopian thought and human nature; when Bul makes a piece she says that it’s about dealing with her own life. The exhibition is an extension of her personal studio practice which we are allowed into. It ends with multiple mixed media sculptures of Bul’s dog wretching. Tags: Artist Profile, Ilene Spiewak, Lee Bul, reviews, University of Seol, Vancouver Artgallery. Bookmark the permalink.